Luxury mountain retreat in the private gated community of Cardinal Landing. Cardinal Landing is an enclave of log and cedar sided homes located next to the Torreon golf course. Gorgeous 3 bedroom, den, 2 bath log sided home with over 1900 square feet of living space. The kitchen opens to an expansive Great Room with a rustic rock fireplace and pine log mantel. Cozy aspen ceilings warm the Great Room and Den. You will enjoy the privacy of the split bedroom plan. The Master Retreat features its own covered deck, walk- in closet, and private bath with jetted tub. 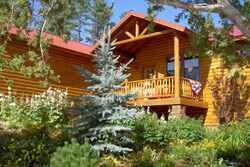 The Spruce Lodge is tastefully decorated with Southwest and lodge log accents. We feature quality beds, designer bedding, and linens. Enjoy the kool breezes and views of the golf course from 3 covered decks! Central heating and air conditioning is available for your comfort. The community of Torreon has it all for your enjoyment; equestrian center, hiking trails, fly fishing pond, restaurant and bar. Golf is available at Bison Golf and Country Club, just minutes away. Restaurants, shopping, golf, antique shops, cinema, lakes, streams, hiking, and more is all nearby! Sunrise Ski Resort is about an hour away.